High Bay racking from Apex offers slightly narrower aisles than used for Very Narrow Aisle system. Cubic space is also maximised in the height of the system such that it is possible to increase stacking heights by up to 100%. Using guided cranes within the racking system the aisles can be minimised with the risk of damage to the system eradicated entirely. 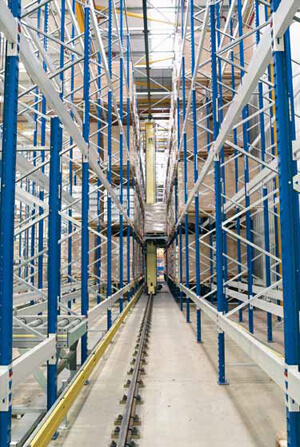 BSE UK recommends the Apex High Bay pallet racking system for use as part of a fully integrated warehouse operation. Designed for use alongside logistics management systems where picking speeds and stock density are very fast and very efficient. One of the many benefits of an Apex storage solution is the reduction in costs thanks to a fully automated operation. With no operational staff required, heating and lighting costs are also significantly reduced. For a competitive quotation get in contact with a member of the BSE sales team today on 0117 955 5211.